Reddit Gifts is like a "Secret Santa" of sorts, and right now they are in desperate need of "Santas" to help out with their current gifts for teachers. You can sign up here to become a Santa or if you're a teacher you can become a recipient. I figured this would be a good place to post this, as a lot of you are avid couponers and may have excess school supplies. Throughout the year, Reddit Gifts does other kinds of exchanges as well, so once you sign up you'll be notified of other ones to sign up for (where you will get something in return, just like you would at work for "Secret Santa"). 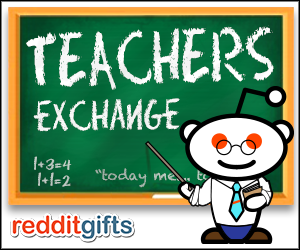 "reddit gifts for the teachers is our annual program where teachers sign up who are in need of supplies for their classrooms, and nice people sign up to send them some supplies! There is no minimum or suggested value of these gifts, they can be as simple as some pencils or glue sticks - anything makes a difference and we need your help! Last year, participants from around the world sent almost $150,000 worth of supplies for teachers as the new school year started.